Hearing loss doesn’t mean losing your quality of life. 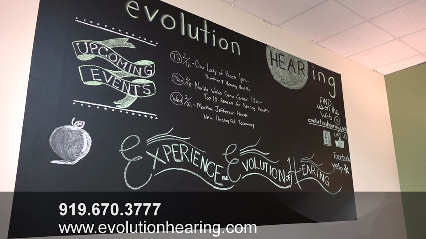 At Evolution Hearing, we are dedicated to evolving your experience. Life is filled with the unique sounds of family, friends, your favorite music, wind through the trees, waves on the beach, and so much more. Our mission is to help you rediscover the sounds, activities and passions that allow you to live life to its fullest. As an independent, private audiology practice we provide personalized care and will help you understand the solutions available to you based on your hearing needs, budget and lifestyle so you can make an informed buying decision. From our doctors to our front desk, every member of the Evolution Hearing team is dedicated to enhancing your hearing abilities and quality of life. We use the latest technology from all of the various hearing aid manufacturers to improve your hearing and offer many styles of hearing aids designed to be as invisible as possible. Don’t let questions about insurance coverage stop you! We also work directly with all types of health insurance plans, and can help you verify benefits, file claims on your behalf, and find clear answers to the questions you have! Call to schedule your FREE, no-obligation hearing evaluation or go to our ‘Contact Us‘ page for to provide us with your information, and we will contact you. Be sure to watch the video on this page, and feel free to check out our YouTube channel for videos we find helpful and exciting. Our blog is updated on a regular basis with interesting articles and news.